Because of that famed traffic throughout the DC area, I always drive my commute with Google Maps to help avoid the worst of the traffic. Today I was greeted with a wonderful message: traffic along your route is lighter than usual! 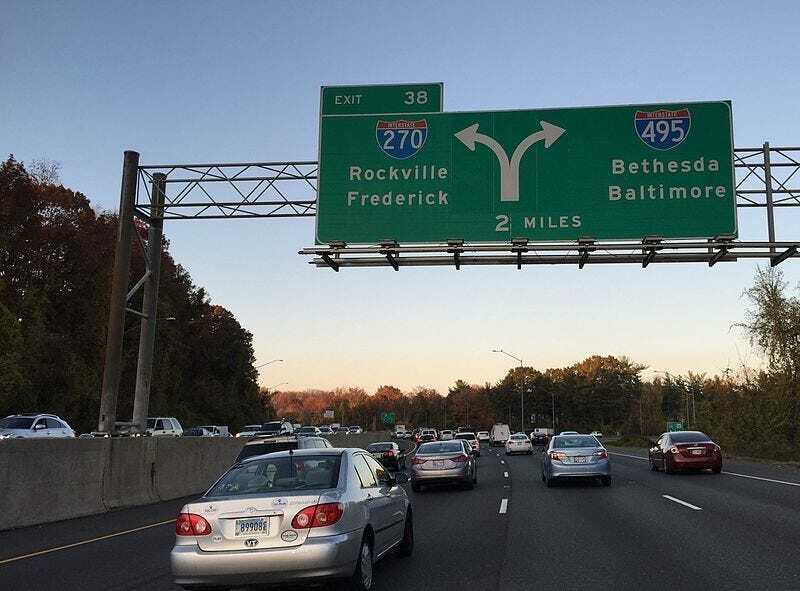 I live and work in two parts of the DC suburbs that are known for their traffic: Rockville, MD and Tyson’s Corner, VA. Rockville’s reputation is mostly but not entirely due to I-270. But thanks to where my house is located, I can actually totally avoid 270 on my commute. The not-270 route is slightly longer distance but during rush hour is often the better choice. Not today though! It’s the Friday before Memorial Day, and this is the first weekend where everyone wants to go to the beach, or to the Eastern shore of Maryland, and they take today off. But hey I’m new in my job, so I’m working today. 270 was clear as can be! The only traffic to speak of along my whole commute was a couple times where I had to slow down to 45 mph. Getting home though, that’s another story. The commute home is always worse around here. I don’t know why but evening traffic is twice as bad in the morning. Tyson’s is a particularly traffic-choked area thanks to perpetual construction of more and more office buildings without the necessary roads to allow people to escape. I can usually make it to work in the morning in 35-45 minutes with some, but not a soul-crushing amount, of traffic. In the evening it’s an hour minimum and can easily become 90 minutes. But if this morning was any indication, I’m optimistic that my drive home might actually be under an hour. Which will be AMAZING. Oh, and about those people heading to somewhere with water? They turn the Chesapeake Bay Bridge into a hellscape parking lot. And I’m going to be one of them! My parents invited my wife and I out to their vacation house near St. Michael’s, MD, on the Eastern shore. We’re only spending one night so as to not leave our cats alone too long, and because we can go any time. But hey at least there will be water and boats and tranquility.